Companies in Japan are increasingly adopting measures such as shortened work hours to help employees achieve a better work-life balance. TOKYO: Companies are increasingly adopting measures such as shortened work hours to help employees achieve a better work-life balance. With the working population expected to decline, it has become urgent to create an environment where women can combine work with child-rearing. Companies are also trying to improve productivity, which is said to be lower than in the United States and Europe. One area receiving attention is telework, which allows people to work from home via computers and other equipment. Meiji Yasuda Life Insurance Co. is set to allow about 2,000 employees, or more than 60 percent of its head office staff, to telework in fiscal 2016. 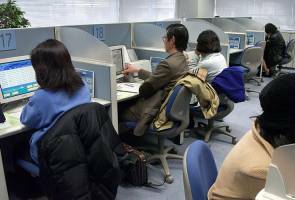 Asahi Group introduced a telecommuting system for all its employees from February, and allows the creation of documents and other materials outside of the workplace. To prevent overwork, many firms have begun to focus on employees' free time. This month, KDDI Corp. started a system that requires employees to have an interval of at least 11 hours between finishing work and returning to the workplace. From June, Ajinomoto Co. is recommending a morning shift and opening its cafeteria from early morning to offer employees freshly baked bread. The aim is to get employees to make more meaningful use of their time after they leave work. It is urgent to create an environment where employees who have child-rearing or nursing care commitments can continue working, an opinion echoed by people in the business community who say improved working conditions will lead to greater productivity. In a survey by the Japan Business Federation (Keidanren) in January, 83.5 percent of major corporations said they were incorporating work-life balance measures as part of their management strategy. However, the survey also found that many of these measures were still rudimentary, such as mental health measures. Only 14.7 percent of companies allowed telework, for which there is especially strong demand from women who are raising children. Against this backdrop, the government allocated a budget of about 2.7 trillion yen (about $217,63,674,000) for fiscal 2015 and has been pushing for the introduction of telework and the establishment of nurseries. Early this month, about 140 companies promoted teleworking and other measures at a Tokyo exhibition aimed at companies and local governments.